The board of British Sky Broadcasting is expected to decide by the end of this week whether James Murdoch should stand down as its chairman. According to a well-placed source, there is a growing view among the company's non-executives that the burden for James Murdoch of "fighting the fires" at News Corporation - where he is in charge of European operations and is deputy chief operating officer - means that he will find it hard to devote enough time to chairing BSkyB, the largest media and entertainment company in the UK. The likelihood is that he will be asked to stand down as chairman at least temporarily, until News International - the UK arm of News Corporation - has been stabilised. If he were to step down pending resolution of the crisis at News Corporation, it is likely he would be replaced by BSkyB's senior non-executive director, Nick Ferguson - who in effect played that role in BSkyB's board discussions over News Corporation's attempt to purchase all of BSkyB. "We would not be pre-judging the guilt or innocence of James Murdoch or of News Corporation in asking him to stand aside" said a source. "But it really is difficult to see how he can play a full role as chairman". On Friday, in an internal memo to News International staff, James Murdoch explained News Corp's withdrawal of the proposal to acquire the shares in BSkyB it does not already own as being "a strong signal that our top priority in the UK is to address the issues facing News International". 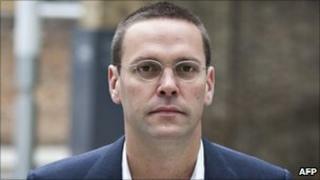 There is also a potential conflict of interest for James Murdoch, were he to remain chairman of BSkyB, in that Ofcom, the media regulator, has said that it may have to review whether BSkyB is a fit-and-proper holder of a broadcasting licence, in the light of the disclosures of alleged systematic malpractices at the News of the World, the Sunday tabloid closed by News International eight days ago. The uncertainty over whether BSkyB should retain its licence only arises because News Corporation owns 39% of BSkyB, and is perceived by Ofcom to exercise significant influence over BSkyB. Update 1532 BST: News Corporation is trying to reinforce the credibility of how it works with the police and cleans up its UK operations by lifting its management standards committee out of its UK arm, News International. The committee will now become part of News Corporation and will report to a News Corp director, Joel Klein. It will be housed in a secure office and will be under the part-time chairmanship of a well-known barrister, Lord Grabiner - who is also chairman of Sir Philip Green's Arcadia Group, owner of Top Shop. As a result of the reorganisation, two senior News International employees - William Lewis and Simon Greenberg - will give up their current jobs and become News Corporation staff, engaged full time in the clean-up of News international. Apologies if you know all this, but I didn't, so thought it worth putting out. Rupert and James Murdoch will go before the Culture Media and Sport Committee as a father-and-son duo, tomorrow at 2.30. Current expectation is that they will be interviewed till 4 or 4.30 - but it could go on longer. Rebekah Brooks will then give evidence to the committee on her own, when the Murdochs have finished. John Whittingdale has asked that Speakers Counsel is present, because no member of the committee is a lawyer, and Mr Whittingdale feels he may need advice on whether a line of questioning might prejudice criminal investigations or future trials in some way. My impression on talking to News Corp is that Rupert Murdoch will attempt to shy away from commenting on the detail of what happened at the News of the World: as the CEO of a global media conglomerate with 53,000 employees and hundreds of individual businesses, he will make clear that he can't micromanage all subsidiaries. There may therefore be an expectation that Mr Murdoch's son, James Murdoch, will be more in the firing line when it comes to the forensic questioning of the committee's members - though at the relevant times, his responsibilities went wider than News International's British newspapers, so he too may not be able to provide answers to everything the committee wishes to know. As for Rebekah Brooks, what may be riveting is what she has to say about her erstwhile friends in the current and previous government. One of her former colleagues told me she felt very badly let down by David Cameron, when the prime minister said he thought News Corp should have accepted her resignation (which it eventually did, last Friday).